Finland's papers on Friday look at interpretation problems at the Finnish Immigration Service and Police, how changes to family reunification policy have affected application numbers, and estimates that seven percent of Finland's children starting primary school next week speak a foreign mother tongue. Tabloid Iltalehti features an interview with an Arabic interpreter trained in Finnish universities who accuses the Finnish Immigration Service of using sub-standard interpreters in their immigration interviews and procedures. The interpreter, who wishes to remain anonymous because she/he continues to work for several authorities, says that immigrant documents are now full of ambiguities due to the professional language deficiency. The interpreter says that things were fine until autumn 2015, as the Immigration Service followed strict rules about interpreter qualifications until that time. But after this, things changed dramatically. "I saw 20 to 30 people sitting in the lobby, some of whom I know. 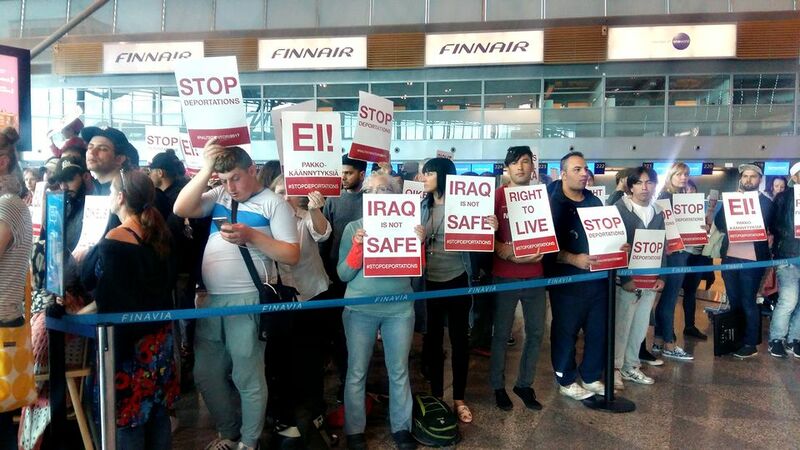 They could not speak Finnish or even Arabic properly. I had interpreted for them myself just two years earlier," the interpreter, who has worked in the field for 15 years, tells the paper. "I submitted complaints to both the Immigration Service and the Police, that the language competence of these 'interpreters' is not sufficient to handle the sensitive nature of issues associated with asylum seekers." The interpreter says that the 'wannabe interpreters' often have no idea what functioning as an interpreter entails, as they come directly from their former jobs in pizzerias or taxi stands. Then they find themselves interpreting situations that could mean life or death for someone, she/he says. There is also the risk that things are left out if an inept interpreter does not understand. The interpreter says she/he knows of several cases in which an asylum seeker speaks of being tortured and captured, but there was no mention of these things in the Finnish-language minutes. "They just skip things and interpret as they please. The Police and Immigration Service are still using interpreters that have a patchy oral command of Arabic; they cannot write or read it." The interpreter says that she/he gets the feeling that the Immigration Service just wants to get through the processing quickly. "These are difficult matters and interpreters struggle to find the correct words sometimes. But still there is rush to get through things. The Finnish Immigration Service is partly responsible for this mess." In a separate article in the same tabloid, the Service's asylum unit director Esko Repo says the authority is aware of the problem, and that a 'mini open tender' for interpreters is currently underway. Continuing on the same theme this Friday, our next selection is from the southwest city of Turku's newspaper Turun Sanomat. It reports that applications for family reunification so far this year look set to exceed last year's levels, despite a legal change last year that tightened procedures and qualifications. The Finnish Immigration Service reports that 1,675 applications for family reunification were submitted in 2016, and 1,532 have been already been submitted from January to June of this year. Refugee advocacy organisations in Finland tell TS that in proportion to the total number of newcomers, however, applications are down. "Absolute numbers may have grown, but hardly tenfold, like the asylum seeker figures," says Pia Lindfors from the Refugee Advice Centre. She says that the number of people granted international protection in Finland increased in volume by a factor of four in 2015-2016, while applications for family reunification are looking to merely double. The groups say that Finland's new laws have made family reunification impossible for many. "It is unreasonable to have a net income requirement of 2,600 euros. It is challenging for asylum seekers and immigrants to find work, and they often end up working in low-income jobs," Annu Lehtinen of the Finnish Refugee Council tells TS. Loved ones are now required to travel to Finnish embassies or missions in person during the process, trips that are often prohibitively expensive and demand dangerous travel through conflict areas. The Immigration Service's senior advisor Leena Turku tells TS that she expects the number of family reunification applications that are refused for financial reasons to grow. And finally, the capital city publication Helsingin Uutiset looks ahead to next week, when the school year will start in most parts of Finland. The National Board of Education reports that some 62,900 first-graders will start in Finnish-language schools, while approximately 3,980 children will begin their primary school studies in the Swedish language. Growing numbers of starting pupils in Finland speak a language other than Finnish, Swedish or Sami. The paper reports that the Board estimates this share to rise to seven percent this autumn. Back in 2014, this percentage was under six. The Board estimates that this year's total number of first-graders is a few percentage points higher that two years' prior. The number of schools is down by five percent, however, as there are now 129 fewer primary schools in operation than there were in 2015. About 35,000 students will start their studies in upper secondary school, the same amount of young people who have been attending since 2015, ending a previous stint of decline in lukio enrolment. Of the remaining 15-year-olds, 46,200 will start in some kind of vocational training programme.